In this episode #99, I focus on the higher education sector and how it can leverage social media for a variety business and academic KPIs. Snap’s new smart glasses let you record video and photos and upload them to Snapchat. The company describes them as: Sunglasses that capture your world, the way you see it. Press the button to record a 10-second video. Press again to keep recording for up to 30 seconds. Press and hold to take a photo. You can even make a splash with spectacles because they are waterproof. Snap says they can even take a photo or video in shallow water! And guess what! You can now buy them from Ireland with Snap having launched a.ie website. Find out more at https://www.spectacles.com/ie. I haven’t had Spectacles but I can tell you I’m tempted! But there’s on big problem! I won’t see a thing, because I wear glasses and don’t use contact lenses. Anyway, I’d love to know if you have a pair and what you think. Snap me to jsbsnaps. Would you welcome a downvote button on Facebook? Well, it seems we might have it soon! Facebook started testing the Reddit-style upvote and downvote buttons on comments back in February. While the feature is still not rolling out globally, more and more users are reporting having access to it and it looks like it might be rolled out across Facebook soon. WhatsApp has raised the minimum age of use to 16 in Europe ahead of GDPR. The Facebook-owned messaging service will demand users confirm they are old enough to use app after raising age limit from 13. Child protection commentators have welcomed the move. However, others have said it’s a backward step as it’s simply avoiding parental consent and those teens under 16 will still use the app. In this episode, I interview Dr. Glenn Hurst, Lecturer and Assistant Professor at University of York in the UK. Glenn completed a degree in chemistry at Durham University followed by a PhD in chemical engineering, specialising in polymer chemistry, at Newcastle University. Glenn’s areas of research include a blend of green chemistry education, utilising social media in higher education and active learning strategies to transform the student learning experience and confer a deep understanding of subject matter. Glenn regularly publishes in the chemical education and higher education scholarly literature. Glenn has recently been recognised by Jisc as being one of the top ten social media superstars in higher education. In this episode, my shoutouts go to three universities mastering social media. Trinity College Dublin is so invested in social that it hosted two #TrinitySsSocial events in the past six months. With over 100 social media accounts and a key emphasis on digital communications, they are an example of how higher education can do social well. The University of Glasgow last night won a major UK award for the UofG social media campaign that accompanied the discovery of gravitational waves earlier this year. The Communications and Public Affairs team beat off stiff competition from major PR agencies to be presented with “Best Use of Social Media” at a gala ceremony in central London. The awards are run by the Chartered Institute of Public Relations. The #CIPREXCEL @tint Best Use of Social Media prize is awarded to @UofGlasgow for their great work on the discovery of Gravitational Waves! The social media campaign earlier this year was directed by Emma Gilmartin, the University’s Social Media Manager and her colleague Dan Marrable. Emma, who is expecting her first child soon, wasn’t able to travel to London to join the party. The gravitational waves media campaign was directed by Ross Barker. The team showed bravery by choosing social media as the only medium through which to communicate a complex message in a very time sensitive way. The team had to ensure their institution was not lost alongside 82 global competitors announcing at the very same time. Their well thought-out campaign on a very tight budget was underpinned by their ability to react, respond and engage across multiple stakeholders. The University of Glasgow became the most authoritative voice on this topic by utilising a wide range of social media platforms in both their home and overseas markets to underpin their aspirations of being recognised as world changers. The success of this campaign has changed the perception of social media across the entire organisation and has created a platform for the future. Anastasia practices what she preaches – as she shares and discusses her own research, research updates, and the wider news agenda on Twitter. Her conversations spark interest and engagement from her students, fellow researchers, and even journalists looking for commentary. “Tweets act as light bulbs, putting the exciting points on the spot. The feedback from other users further enhances this understanding – if anything receives likes retweets and any kind of attention – I know that I am on the right track. My research is of worth to the public. In today’s JSB’s column I’m sharing my presentation from the recent #TrinityisSocial event. A one-day social media conference hosted by Trinity College Dublin for their academic and research staff. My presentation: Creating a Digital Footprint of your Research – Why, How and Where, was very well received. In it I shared my blueprint on how to promote your research online using my 4-step formula. The social media tool that saved my working week this week is Leetags. Instagram Search – The only application in the world to do real-time search on Instagram the most relevant hashtags related to any subject. 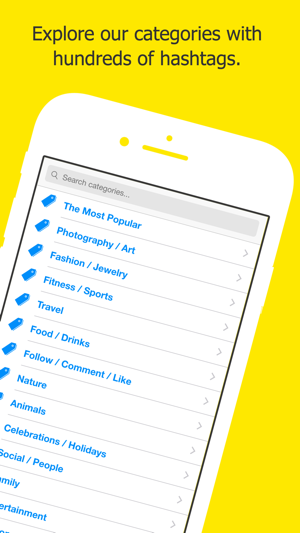 Categories – Hundreds of categories related to various subjects with hashtags chosen by hand by our team for you to use. Favourites – Save the results of your searches, categories or create a favourite to save your time when using hashtags. Smart and random selection – Select the best hashtags automatically or if you prefer randomly select to diversify. FAQs – Read our tips and answers to frequently asked questions about Instagram and hashtags and increase the engagement of your posts.